Always wanted to be a HAM radio operator? Then mark your calendar: September 22nd and 29th, 2018. Sponsored by: The City of Blaine, the Blaine Police Department, and the Blaine Auxiliary Communications Service (ACS). Blaine ACS is hosting this entry-level licensing class for people who wish to obtain an Amateur Radio License. The class takes place over two sequential Saturdays in September, from 9:00 am to 5:00 pm. On Saturday the 22nd , you will receive seven hours of classroom training, with plenty of time for interacting with your instructors and other amateur radio operators (hams) from Blaine ACS. You will also receive study materials and a reading assignment to be completed by the 29th. Official Welcome at 10:15 am. Watch Community Service Volunteers in action. Learn about Blaine ACS and our Emergency Communications Network. Don’t be a victim! Learn about preparing yourself and your family for an emergency. Learn how to assemble a bug-out kit. See ham radio operating demonstrations; talk on a radio; win a door prize. Well, not exactly “hiring”. More like “recruiting dedicated volunteer radio operators”. Due to some recent retirements, Blaine ACS now has openings for new members. If you are a licensed amateur radio operator, or might be interested in becoming licensed, please consider joining ACS. ACS is a group of civilian volunteers who donate our time and energy to provide emergency communications in support of the Blaine Police Department. We offer extensive opportunities for fellowship, personal growth, formal training, and leadership; and we offer year-round opportunities to engage in community events and emergency exercises, not to mention radio station building and operation. If you have any questions, or for more information, please get in touch with me, Chris Doutre, ACS Manager, at kg6sko@arrl.net. BLAINE, October 23, 2014: Chief Mike Haslip organized this training session at the ACS Training Facility yesterday. 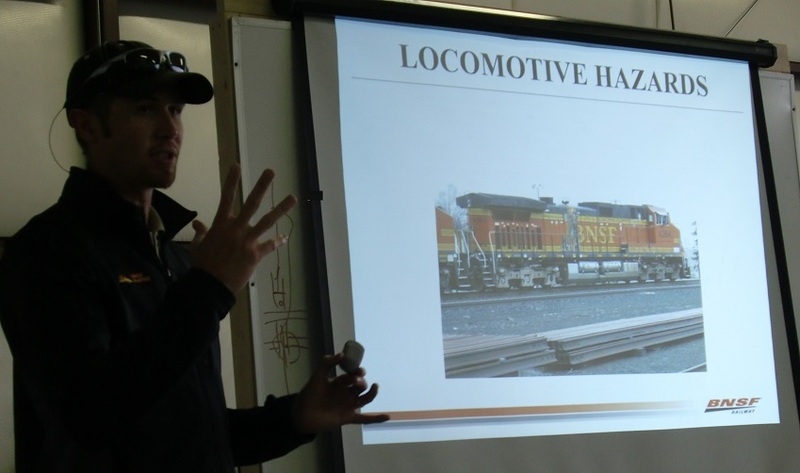 He invited Justin Piper from BNSF to present his two-and-a-half hour session on “Hazardous Materials Awareness for First Responders”. Justin is an excellent instructor and the materials presented were first class. We learned about how important it is to contact BNSF’s emergency response center immediately (1-800-832-5452) if we spot a railroad-related emergency. The operators there can provide (by email or fax) all the information needed to immediately determine if a particular train is carrying hazardous materials, what they are, and exactly what cars they’re in. 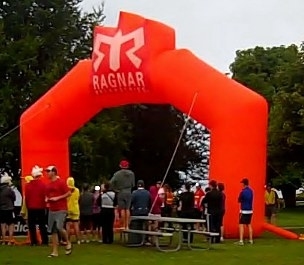 The Ragnar overnight running relay race began at Peace Arch State Park in Blaine Friday morning with approximately 350 teams of 12 people each (over 4060 participants – many in crazy costumes) and ended in Langley, WA 200 miles later. Blaine ACS Communication Van stationed at Peace Arch State Park and ACS members positoned at four checkpoints along with mobile support provided nine hours of emergency and Relay-related communications within the City of Blaine. Limited sunscreen was needed – it rained! Another great Field Day weekend has come and gone, fun was had by all. Set up began on Friday afternoon about 5:00 pm and we were all wrapped up about 1:30 pm on Sunday. Blaine Police Dept. ACS operated in the 2 (two transmitter) class, we were 2A WWA. Station one was in the ACS communications van using the new ICOM IC 7000 and station two was in the hanger using a Drake TR-7, both stations used wire OCF windom or vertical antennas. This was really great training for our operators that normally don’t use the HF bands. Radio condition were better than the last few years and we made more contacts the ever before, along with the great weather was nice too. There will be a two-hour WebEOC class on January 5th, at 9:00 am, at the OCC in Bellingham. Contact KP2X for more information or to register. As Jim said at the ACS meeting last night, WebEOC will be a critical part of our emcomm future so we need to get this training sooner rather than later. If you can’t make this class, be aware that there will be more classes in the future. Stay tuned. Our next “Beast Day” will be held at the hangar on 12/29 at 9:00 am. See you there.